There’s always a chuckle and mystery with words. True. What I find interesting is the combination of the Norse contribution… the mundane and the violent. Of course, for the Vikings, violence actually was mundane… in the sense of being their ordinary, daily occupation. Not sure if I should apologize for myNorsk ancestors? I apologize for the pillaging of mine… but I remember that 90% of what they did was explore, trade and farm. I just wrote a review of the Poetic Edda for Scrivener journal. In doing so I looked up some of the Old Icelandic phrases to catch their alliteration. Here’s my favourite in English “The giggling gods walked in on you riding your own brother, Freyja, and then you farted.” (Jeramy Dodds). That word, “farted,” is “frata”, and here in Loki’s taunt “rhymes” with Freyja. Do you have a link to your review, or doesn’t Scrivener make that available online? It will be printed this spring, I think, but email junkola [at[ gmail [dot] com and I can send it to you. Well, time to head outside and work on a safe kennel space I’m building for when our new puppy is outside enjoying the sunshine… she’s a beautiful dog… from docga used for a powerful breed of canine that displaced the Germanic, Old English hund. Mussolini ruined Italy, but for a few years he made the trains run on time. The Japanese bombed Pearl Harbor, but gosh they certainly do make dependable cars today. Ah, invaders… it’s not all bad! Very interesting! Thanks for a well-researched post. Excellent look at the Norse through language. I love the image of a mother holding a rose-faced little girl asleep in a bunting and saying, “This is Warbattle.” Norse names also tended to mean things like “Elf-counsel” and “Battle-friend”. Yes, that’s quite an image. I sometimes ask people what their name means, and I’m amazed at how many of them have never given it a thought. This is wonderful! I’m bookmarking this for further study – I’d love to do a thorough study of Old Norse one day! It is a fascinating subject, isn’t it? I wouldn’t be surprised if there isn’t an online community devoted to the subject… complete with teaching aids for us novices. 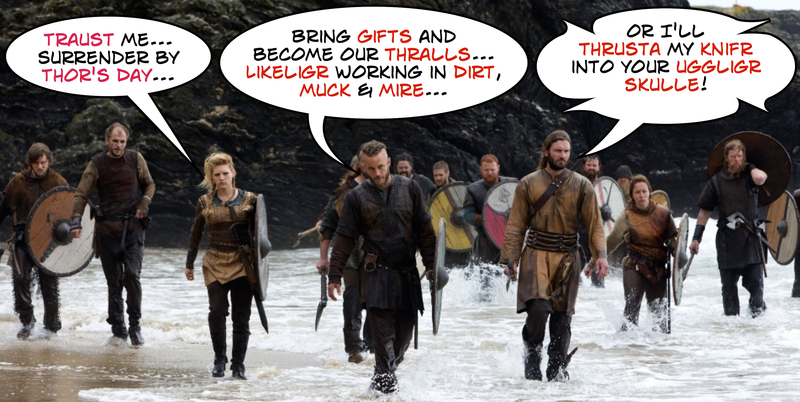 Mere Inkling offers up a fantastic overview of the Vikings linguistic legacy. It’s enjoyable and informative, but not too overwhelming – if you’re not already interested in Norse influence on the English language, you will be after reading robstroud’s post from April 14th.